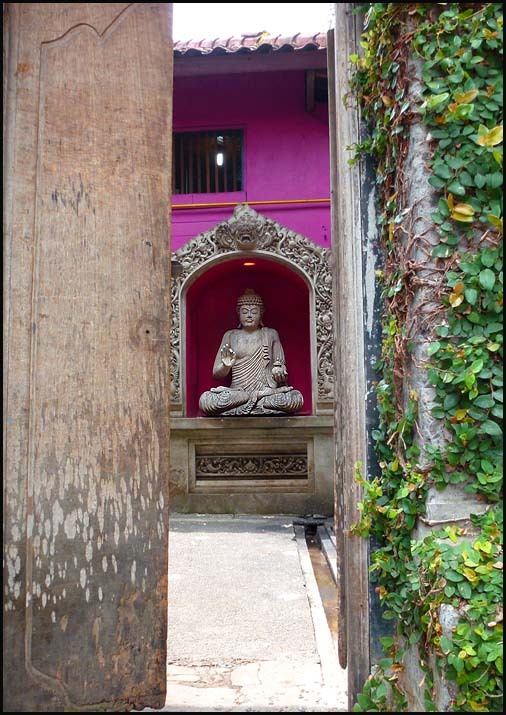 The trip starts and ends In Bali, which is a perfect place to heal the jet lag and to go for some luxury after almost 4 weeks in the forests and in basic hotels. We have thought long and hard about a parrot trip. The idea was at first a Cockatoo trip, but we realised it could as well be called an Eclectus trip. I think all parrot people would like this trip and we will focus on the parrots. But we are travelling to islands of two of the world’s most sought after Birds of Paradise (Wallacea’s Standardwing in Halmahera and Wilson’s Bird of Paradise in Waigeo), so we will include them too. A total of 26 days island hopping in 5 islands (and transfers in a few more islands). Most locals live in utter poverty. 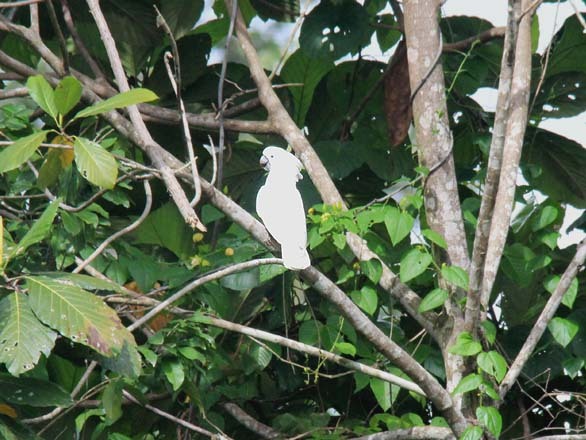 There are no hotels where the birds are, so you need to be prepared for some FRUGAL living on this tour (almost all birding tours in Indonesia actually). We travel in the equatorial region – which means it’s hot and humid 24/7. You will need to bring light clothes that are quick-dry as we are sweating just by standing up. You will need to bring a mosquito net for protection and also a comfortable sleeping mat. We will stay at houses of locals and often we just sleep on the living room floor. You would also need to take malaria prophylaxis as eastern Indonesia is notorious for malaria. The hotels we’re staying in are reasonable. They are clean and nice, but don’t expect anything extra. Regarding food; we eat what the locals eat – which means loads of rice and vegetables. Animal protein will in most places be eggs, but also chicken or fish. Mehd Halaouate will be your guide all the way. He is fluent in English, French and Indonesian. We meet in Bali and spend the first four days in Sumba for Citron-crested Cockatoo, Sumba Lorikeet (Trichoglossus h fortis), Sumba Eclectus (Eclectus r. cornelia), Great-billed Parrot (Tanygnathus m. sumbenensis) and Red-cheeked parrot (Geoffroys g. floresianus). Sumba is famous for its IKAT weaving and we’ll stop at a local market for you to see ikat and other items. Maybe you would like to bring some gifts home with you? From Sumba we fly to Seram and Tanimbars by transfers in Bali and transfer on to Makassar in South Sulawesi. We need to spend a few hours at a hotel before taking the early morning flight to Ambon. Ambon is our base both for Seram and later on for the Tanimbars. When we land in Ambon we go straight on to get the bus to Seram. We need six days to be sure to find the Seram Cockatoo. We will have to do some quite rough trekking to get to the parrots here. Just be prepared with comfortable walking boots and patience. Our bonuses in Seram are Red-flanked Lorikeet (Charmosyna p. placentis), Purple-naped Lory, Rainbow Lorikeet (Trichoglossus h. haematodus), Red Lory, Blue-eared Lory, Eclectus (Eclectus r. roratus), Great-billed Parrot (Tanygnathus m. affinis), Red-cheeked parrot (Geoffroys g. rhodops) and Red-breasted Pygmy parrot. When we come back to Ambon from Seram we’ll have a nice dinner and recharge with a good night’s sleep in a hotel bed. We’ll fly from Ambon to Saumlaki in the Tanimbar Islands in our quest for the Tanimbar Corella. 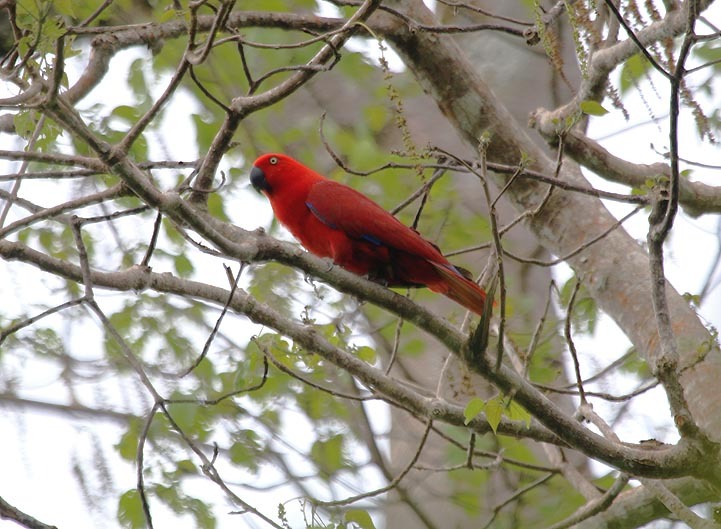 We’ll spend three days here with fairly easy bird watching and aside from the Corella we will be rewarded with the beautiful Eclectus (Eclectus r. ridelli) where the female has an all red breast. We’ll also have a chance to see Blue-streaked Lory, Great-billed Parrot (Tanygnathus m. subaffinis) and Red-cheeked parrot (Geoffroys g. timorlaoensis). We leave Saumlaki in the morning and will fly back to Ambon just to catch the lunch flight to Ternate. We will have enough time to go to the local market in Ambon and have brunch in before we fly. Ternate is the volcanic island that is the capital in northern Moluccas and we need a hotel night before we catch the ferry to get to Halmahera. 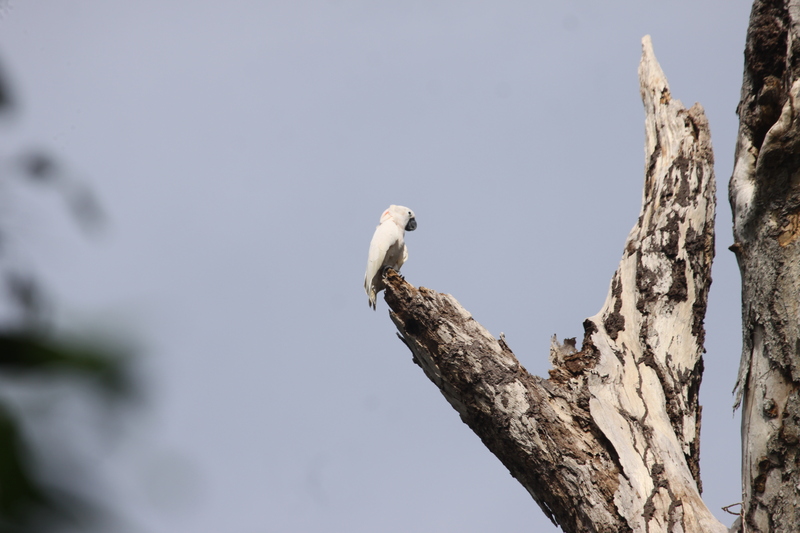 We will spend four days in Halmahera for the Umbrella Cockatoo. Other gems are Wallacea’s Standardwing (an amazing Bird of Paradise on top of MANY birders wish list), Red-flanked Lorikeet (Charmosyna p. intensior), Chattering Lory, Violet-necked Lory (Eos s. riciniata), Eclectus (Eclectus r. vosmaeri), Great-billed Parrot (Tanygnathus m. megalorhynchos), Red-cheeked parrot (Geoffroys g. cyanicollis) and Moluccan Hanging Parrot. When we head back to Ternate our hotel awaits us for another night of recharging and sleeping comfortably. Next morning we will start the final leg of our parrot tour going to Waigeo Island in the westernmost part of Papua. Don’t forget your swim and snorkelling gear because this is one of the best diving/snorkelling waters in the world! We will take the morning flight from Ternate to Manado in north Sulawesi. We will have a few hours layover here so there’s plenty of time to go for lunch. (We might even stop here for a night and visit Tasikoki wildlife and rescue centre, but we haven’t decided about this yet.) Anyway we fly on to Sorong from Manado and will have another night at a hotel. The ferry to Waigeo leaves at lunch time the next day so we will even have the pleasure of sleeping in. We will go by taxi to a native little village and our quarters will be huts built on stilts on the water. The local villagers will cater for us and will also guide us. 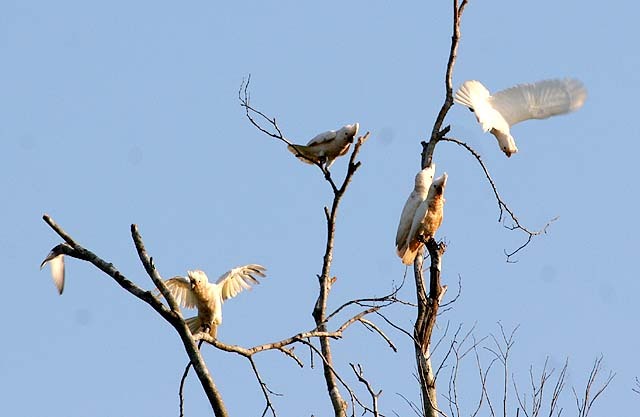 Not that we need any guiding to see the parrots – they fly across the sky all day. And the village is dubbed Eckie heaven by Mehd. We will need a guide if we’re opting for the Wilson’s Bird of Paradise. This is highly optional but we warmly recommend it. 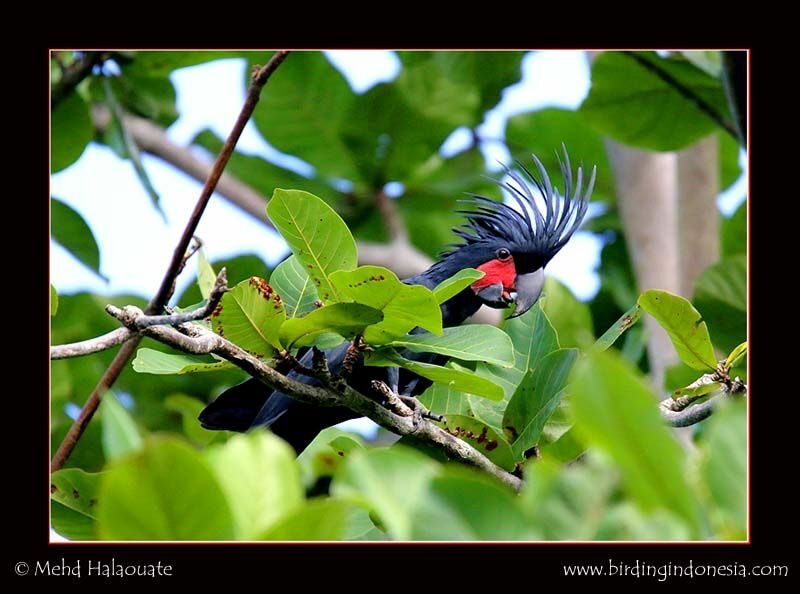 It’s another of those Birds of Paradise on the top of most birders wish list. You can –of course . sleep in, go snorkelling or just sit on the porch watching Palm Cockatoos fly by! Other gems here except Palm and Sulphur-crested Cockatoos are Red-flanked Lorikeet (Charmosyna p. ornata), Black-capped Lory (Lorius l. lory), Rainbow Lorikeet (Trichoglossus h. heamatodus), Violet-necked Lory (Eos s. squamata), Eclectus (Eclectus r. polychloros), Great-billed Parrot (Tanygnathus m. megalorhynchos) and Red-cheeked parrot (Geoffroys g. pucherani). 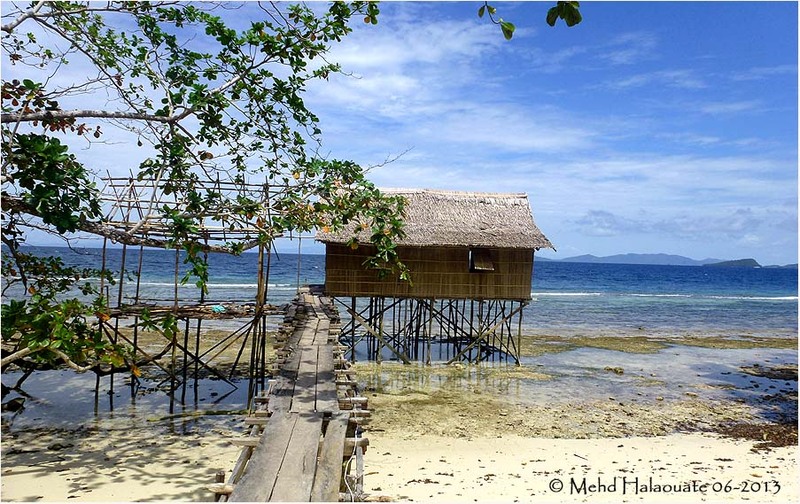 The hut we’re staying at in Waigeo, managed by the village. We have a hotel night in Sorong before flying back to Bali again. This flight is also at lunch so we can have a lazy morning summing up the tour together. Anyone who’s up for some final birding can have the chance to see Double-eyed Fig Parrot, Yellow-capped Pygmy parrot, Orange-fronted Hanging Parrot, Black Lory , Dusky Lory and Red-fronted Lorikeet. When we finally land in Bali again it is late evening and we will spend a final night together at a nice hotel. The itinerary and dates are now final! The price will be decided in mid-January. I’m glad you like the concept! I’ve updated with the Eclectus species and also decided to push the trip forward to 2016. Sounds like a dream vacation! Please keep us in the loop as this develops. How many people will be going on this trip? It sounds fantastic! We hope 4-6 persons (+ Lena and Mehd as guides). Maximum 8 persons+2 guides and then we can divide into two groups while birdwatching! We are interested in the July 2016 journey. My wife is a university professor, so she has summers free. This trip sounds amazing! And, as supporters of WPT and volunteers for Tambopata Research Center and The Ara Project, we love that you are donating proceeds to WPT. I will write you and your wife down for 2016. It will be an amazing tour! My family (three of us – all adults) is interested in this trip. Sounds fabulous. I am really looking forward to hearing the price update in a few weeks!! I’m glad to hear that you are interested in this amazing tour! We will announce the price in mid-January when my husband Mehd is back from Borneo. I’ll get back to you as soon as we have set the price. Lena, Barbara and I are as excited as ever about this trip! Thanks for your hard work at figuring out this price, which is a fair one for such a major expedition. We are also excited to finally have a tour where we focus on the parrots. I’ll keep you posted when there are more news. I am from the U.S. I live in Kansas City Ks. I am interested in this or another tour some time out if this one is full. How do I go about finding more info for this one! This one is not fully booked yet 🙂 I will send you more info via e-mail.